Taylor Murray scored 21 points and Tatyana Wyatt added 11 as No. 15 Kentucky took down No. 25 Missouri in Memorial Coliseum on Thursday night. Rhyne Howard and Maci Morris only had 4 points each, but Kentucky used a full team effort to pull out a big victory over another ranked opponent. Kentucky only hit 19 of 54 shots, including only going three of fourteen from behind the arc. The Wildcats’ defense held Missouri to 13-of-39 shooting and made up for the lack of offensive production. The Tigers managed to hit seven of nineteen from behind the arc, but only made six of twenty of their two-point shots. Kentucky forced Missouri into 20 turnovers and turned those into 21 points. Kentucky turned the ball over 13 times, but Missouri was only able to score 8 points off of them. Kentucky won the battle of the boards, 37-25 and the Cats had 17 second chance points. Kentucky also held a huge advantage, 26-8 on points in the paint. Missouri got off to a great start, taking a 7-2 lead on a pair of three pointers and a free throw. Meanwhile Kentucky was cold, hitting only one of its first seven shots. The Tigers would take a 12-6 lead before the Cats answered with four in a row on baskets by Ogechi Anyagaligbio and Blair Green to cut the lead to 12-10 at the end of the first quarter. Kentucky would go scoreless till the 5:30 mark in the second quarter. The Cats and Tigers struggled to get the ball in the basket. Missouri was able advance the lead to as many as seven, 21-14, before Kentucky scored four in a row to cut the lead to three, 21-18, which would be the score at half time. Morris led the Cats with four points and Jaida Roper added three. The Cats hit just 7 of 25 from the floor through the first half. 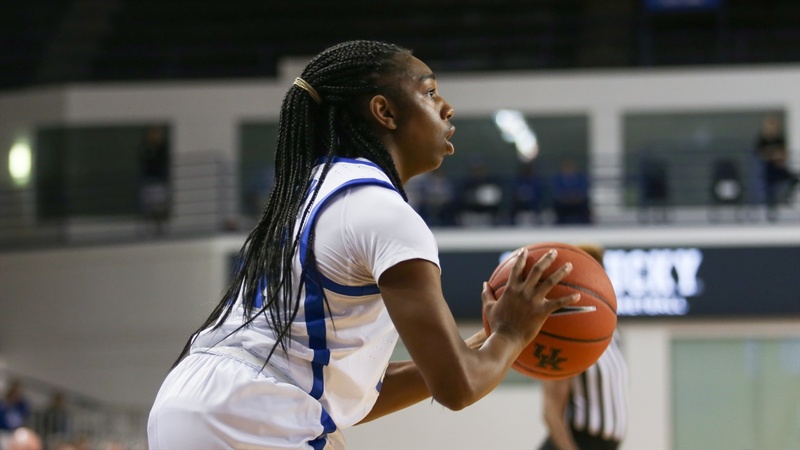 Kentucky’s struggles on the offense continued in the third quarter until Murray took things into her own hands by scoring six points in 45 seconds. Kentucky turned a 3-point deficit into an eight-point advantage. Murray hit her first five shots from the field in the quarter and scored 12 of Kentucky’s 13 points. Kentucky would stretch the lead to nine before settling with a 36-28 lead at the end of the third quarter. Missouri got closer cutting Kentucky’s advantage to six, before Kentucky mounted a 7-2 run to take their first double digit lead of the game. The Tigers would eventually cut the lead to five on an 8-2 run, but Kentucky wouldn’t let them get closer. The Cats came away with a hard fought, 52-41 victory. Kentucky is back in action visiting Texas A&M on Sunday at 5 p.m. ET. The game can be seen on SEC Network.